The Heating plant heats 2,527,000 square feet of classrooms, residence halls, and offices on campus. The Heating Plant was built in 1916. In 1969, a remote automation center capable of controlling and monitoring all of the room air systems on campus was installed. The Heating Plant was converted from coal to gas in 1965. 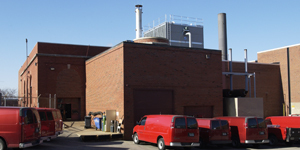 The change to gas made the operations quieter and cleaner and allowed the heating plant to meet future growth requirements without relocating.